Many, many cruisers sail double handed (DH) most of the time. Some of us do so because we prefer sailing with our spouse or maybe we can't get suitable crew. Either way, while you’re out there don't you wonder just what's involved in going farther? Just the two of you? Maybe you think about going over night or for a sail around the Big Ocean? It all starts with double handed sailing confidence. The purpose here is to discuss some ways in which sailors can improve their DH skills. Improved skills lead to longer passages, new cruising grounds and great satisfaction. The authors, Norm and Elizabeth, are experienced practitioners. Here is some of what we do and what we’ve learned. Our best learning took place in our distance double handed racing program. We cruise to the race, race, and cruise home. Try it, you'll like it! The starting point to DH competence is becoming good at one another’s jobs. In the race-training field we call it crew appreciation day. The skipper has to grind and hoist while the bow man steers. Simply reverse roles. The essence of DH success is knowledge sharing. Communicate how you do your job to the other person. You'll be surprised at what you take for granted. What are our on-deck practices? Elizabeth and I bought our Aphrodite 101, AVERISERA, in 2007 and assumed the usual pink/blue roles for the stormy three day delivery home to Boston. After that, we started job-sharing, and planning day sails around a specific task. Docking and un-docking were first. Then making and taking sail and reefing. Steering through jib and main tacks and gybes was pretty easy. It wasn't long before the kite was up and we practiced straight line gybes, rotating the cockpit and fore deck jobs. Together we learned to watch the weather and forecast our near term conditions. Weather is now one of our top skills and it pays big dividends racing and cruising. We are both pretty good at navigation. Here we make certain we use the same terms. Elizabeth does have one requirement: we both study the chart and tides before we leave the dock. We make a plan. It is our baseline for the sail or cruise. There is a long story for later about our failure to do so once. Suffice it to say, I assumed one night that E knew about a certain set of rocks. No grounding but some serious stress. Never again do we take the other’s knowledge for granted. What about down below? We have had no problems with living aboard, cooking, stowing, and staying neat and tidy. Before we set out to either race or to make passage of, say, more than 18 hours, we have a meal plan for hot food simply prepared. Our bedding is set out and made ready for quick entry. We never wear foulies forward of the companionway to keep living spaces dry. The “on” watch always starts the tea water for the “off” watch. The person coming on watch reviews the chart and does the knowledge transfer before coming on deck. Small comfort issues matter a lot. One big problem came up when Elizabeth had to go off watch and nap. She couldn’t rest. Uh oh, that’s a biggie. We practiced sleeping off watch. When Norm is below, Elizabeth has to know what to do on deck and trust herself, so Norm can sleep. When below, she has to sleep. Part of that is her trusting Norm not to fall overboard, get hurt, etc. The sea noise and the worry eventually subsided and we both get good rest. Rest is a key safety factor. Learn to rest and do rest. Set up your boat for safe DH sailing. Some of the best references for safety are found on websites for clubs that sponsor DH races. We sail in the Northeast where Newport is a center for shorthanded sailing and racing. Look up the Newport Yacht Club's rules and requirements for the Bermuda One-Two, New England Solo-Twin, and Offshore 160, for example. The Storm Trysail Club is another resource. AVERISERA is equipped with jack lines, a boarding ladder that is rigged while racing, safety harness and tethers for each of us, plus we each have a Type One PFD in addition to our usual Type Threes. When we go below, disconnect the safety tether at your harness leaving the tether hanging in the hatchway for quick reconnect. We also keep a Man-Overboard-Pole tethered to the lifelines, in case our safety routine breaks down and someone winds up in the water. Best approach is prevention, but the MOB is a backup piece of safety equipment. Tiller boats may choose to run a continuous line from the tiller, up one side and back down the other to the tiller. In this way, the boat may be steered from anywhere on deck. Our tiller auto-pilot is handy, too! 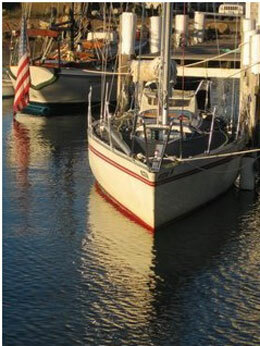 Here is a DH goal: sail off the dock or mooring, cruise, and sail back onto your dock or mooring. No raised voices! That’s proof that you are an accomplished DH couple. Races are fun but cruises are better when you work seamlessly together. Here is a DH tip: one person should be very well rested before you enter a harbor. Both must be familiar with the chart and oriented to the landmarks and buoys. Start a double handed race/rally program at your club. Both racers and cruisers will enjoy the challenges. At our club in Boston, Constitution YC, we designed a night race and opened it up to DH participants. It is run in June when there is a lot of daylight and usually a breeze. We start everyone pursuit style and the race is 40 nm in length. I think 60 nm is a better distance if your club has a lot of participants with PHRF values below 120. In any event, finish back at the club for breakfast and sea stories. It is a good way to spend a night. We have a sailing/family blog at www.averisera.com. You will see the little boat we built, the big boat we race and cruise, and our nine foot nutshell pram. The blog started with our buying AVERISERA and continues to this day. We have been married since 2009. 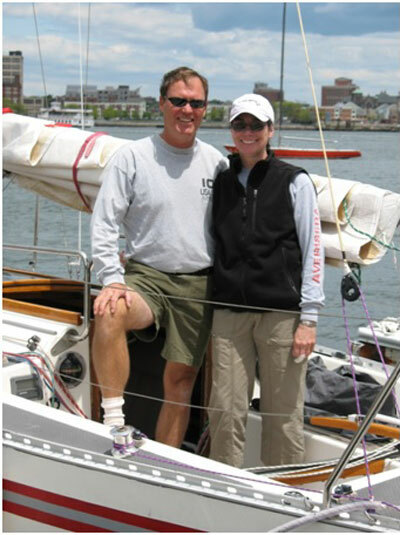 Norm is a sailing professional and spent almost twenty years working for Boston Sailing Center. He has sailed across the Pacific twice and up and down Atlantic between New England and the Caribbean a dozen times. He met Elizabeth when she was assigned to his boats for a couple of cruising courses through BSC. Elizabeth is a self-professed geek, mom, grandma, gardener and knitter, who sails. She is now retired from her high tech job, and is enjoying her free time pursuing the interests listed above and whatever else comes along. Her sailing resume includes double-handing a 45-foot racing sailboat around the Caribbean one season, and an ocean passage delivering a 35-foot Beneteau from Boston to Puerto Rico. 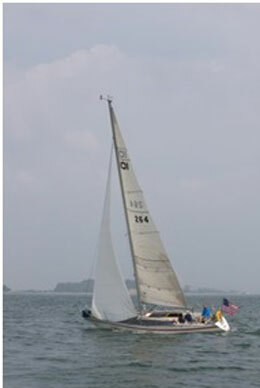 She enjoys racing and cruising Averisera in the plethora of harbors in the Northeast, with a particular fondness for long Maine coastline harbor hopping. 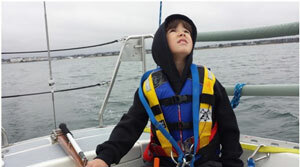 A grandson all tricked out for a late Fall sail. His tether has a long and a short lead. We let him roam around the boat so long as he is clipped in to the jack line. We have the same rule for ourselves. He has to wear a PFD to comply with the law. Adults often forego the PFD for a tethered harness. AVERISERA sailing in Boston Harbor. This was taken by a friend as we sailed out for a spinnaker training day. We would always do a little work and then have some relaxing sailing time. At the Black Dog Pier on Martha’s Vineyard. Note that we are down by the bow and list to port. That is cruising mode. We like to visit places we sail past when racing. In race-mode, the boot stripe is almost an inch higher. Norm grew up sailing. 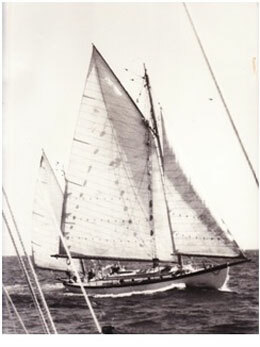 This is the family yawl, Thetis, in the Bahamas in 1961. AVERISERA is on a hard reach under a double reefed main and number 4 headsail in Cape Cod Bay. Note the jackline along the side deck is lead inside the shrouds. 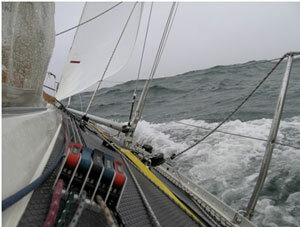 I often use an outside lead for the headsail when reaching. The two of us, Norman and Elizabeth, aboard AVERISERA in Boston Harbor.